I am just back from Moldova where we conducted the initial meetings of the Moldovian IT Mark program of ESI Center Bulgaria. The IT Mark service is an interesting program that helps small companies get on the road of process improvement. Chisinau is a nice city with strong European flavor. I have been able to take some pictures you can see themby clicking on the link below. If you happen to go to Moldova do try their wine it is like no other and is quite cheap. I will try to drop few lines about IT Mark later when I have some spare time. 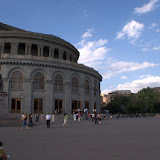 Meanwhile you can look as well at my pics from Yerevan Armenia where I lead an Intro to CMMI training in June 2007. Also note there will be an Introduction to CMMI training in Sofia, Bulgaria at the end of this monnth or early in November. Please contact ESI Center Bulgaria to get more info and sign up. A series of small projects or an endless project is a dilemma for all people implementing CMMI practices in environment that operates a support team that performs series of small fixes and enhancements. Over the last one week I participated on two separate occasions in discussions how CMMI is to be applied in such environments, so here is my view on the topic and links to relevant information. Firstly the current version of CMMI is called CMMI-DEV i.e. it is designed to address development organizations primarily while leaving an option of interpretation for service environments. There is going to be a separate CMMI-SVC constellation(edition) of CMMI to be announced in 2007 that will be written specifically with the service organizations problems in mind. Thus should one be impatient to implement CMMI or if the service business is only a fraction of the overall business some interpretation of CMMI-DEV will be needed. It gives mapping/interpretation of CMMI practices in the context of service organization. One particular area of interest is how one defines a project in support environment. CMMI-DEV v1.2 brought additional ease in interpretation by taking special attention during design and development of the model for expanding the model coverage. Most changes in this regard are in the informative material and provide notes and examples for usage of practices in service and hardware organizations. There is however one change in the glossary that is of significant importance to this subject. Prior to v1.2 CMMI has adopted PMI alike definition of project i.e. a group of resources directed towards a common goal with a definite beginning and an end. This came to a change in v1.2 now a project in required to have a start point but is not required to end/finish. This small change allows now organization operating support team to maintain a single plan for maintenance that has many small phases estimated separately. 1. CMMI-DEV v1.2 is friendly towards service environments. Few examples are the definitions of terms in the glossary: Project in the glossary is defined as something that has a start and operates according to plan. There is NO requirement for end or completion unlike PMBOK. Thus project can be the overall setup for delivery of products/services. Product in the glossary covers both tangible products and services. Quote "In the CMMI Product Suite, a service is a product that is intangible and non-storable. (See also “product,” “customer,” and “work product.”)". This makes life easier in defining what the support project produces. This makes me believe you can implement CMMI-DEV practices in an environment that does small support tasks within the context of a larger contract. 2. CMMI does not prescribe life cycle i.e. you decide what phases you will have in servicing a request. There could be guideline as to what is required for different types of requests i.e. what phases. Ultimately there is sense in each practice in the CMMI model and your processes should cover all of them to be appraised. It is the business need that should drive the definition of the exact details of the preformed activities and their scheduling. 3. There is one critical distinction when talking about outsourcing - who owns the processes. If it is the client organization then they ought to go for appraisal and what the supplier does is personnel leasing i.e. supplier ought to enhance upon its people management capabilities, not CMMI, may be People CMM. If it is the service organization that owns the process then it should work on improving processes using CMMI practices.